Why is there so much about angels in the Nativity narratives of the Bible? I suggest that these angels are the audience. A bigger theme than “God with us”? God is telling this story to the angels. But why are the angels the audience? Well, that’s actually the question that the Bible is intended to answer. What does this mean for my faith? The Biblical account is a narrative. It is constructed in the form of a story. So if the whole story of God is being told through the history of God’s dealings with creation, who is the story for? Who is the audience? It can’t be God, because he is the narrator and primary character. It can’t be “us”, because we also are characters in the play. I will suggest today, that the story is unfolded before the “heavenly host”, which means the angelic beings, the cherubim/seraphims, and the angels. It is something that God is patiently explaining to the angelic host so that they can comprehend the final reality, which is otherwise scandalous: That humanity is to inherit the Kingdom of God, which includes authority over all creation and the angels themselves. We also would do well to comprehend the final reality, which is why we are given access to the narrative, including “how the story will end” – its future consummation, even as it is still unfolding around us. Please pop across to another post, which summarises who the angels are: “Who are these “angels”, and what do they want?“. That article explains who they are, but then links back here to explain what they want. What is the purpose of all these angels? Is it merely to make the heavenly choir sweeter? The story of the people of God is a bold and sweeping drama, spanning millennia. It begins with God in the act of Creation, and then the characters of people and Satan are quickly introduced in the Garden. The story unfolds with an almost immediate crisis in Genesis 3, for which there seems no available resolution (the introduction of sin, and a fracturing of the relationship between humanity and God). The whole narrative continues in pursuit of an ever-elusive solution to that core crisis through the Flood, the Calling of Abraham, the Enslavement in Egypt, the Exodus, the giving of the Law, the wars of the Holy Land, the Kingdom, the Exile, the Return, the Roman occupation, the Christ, the Ascension, and Pentecost. At this point, the story has turned. There is hope! The crisis may yet be resolved, but persecution, false teachers and faithlessness still loom menacingly. By an extraordinary privilege, we are even told how the story will end: the return of Christ, and the “new heaven and new earth”. In the end, the crisis will be resolved, and God will again have full relationship with humanity. But along the way, something has changed. There has been a profound shift in the order of things in the universe, and that shift is the real theme of the Biblical story! It would be fair to say that a single, unifying theme of the Bible is “God with us”, but that only makes sense when viewing the story from our own perspective. The point of the theodrama is not so much “God with us”, because “us” is a character in the play and the point of a play is to provide a theme for the audience. The “point” as far as the audience is concerned can be different from the “point” of the whole experience for the characters involved in that story. For example, the events of the Holocaust in WWII have one significance for those who experienced them, and a potentially different significance for the rest of the world as we remember the same events. Neither is more “correct” than the other. These are just different points of view to the same story. Of course, for us, “God with us” is the most precious and the highest possible contemplation of the goodness of God throughout the Bible! For our relationship to be restored with God is our deepest desire, and indeed our deepest need! I don’t want to downplay that, but simply to point out that the whole drama is not actually, directly, exclusively, all about us. If there is an audience, and the audience is the angels, then the significant message they receive could be quite different from “God with us”. Indeed I suggest that it must be; The angels already have God with them. The angels are the audience! What a crazy thing to say… I mean, the angels are pretty much a bit-part, right? They turn up to make announcements, and they sing around the throne, but in the story itself, they’re virtually dispensable! They hardly do anything. Even their role as messengers could be replaced by the Holy Spirit delivering the required words, as He does at other times. The Big Bad Wolf sneaks visibly behind her, turns to the audience and makes a shush signal. As Red turns, the Wolf hides. Red interacts with the audience implying that they are mistaken until they are screaming almost uncontrollably in delighted frenzy, at which point the Wolf slinks away. The role of the angels in the Biblical drama is not completely dissimilar to this. At key points in the narrative, they turn up to announce what the Scripture makes clear to the reader, but which may not be apparent to the characters in the drama. Appearing to Zachariah, telling of Elizabeth’s pregnancy (Luke 1:11-20), because Scripture had foretold of John the Baptist (Luke 3:4-6). Appearing to Joseph, (Matt 1:20-21), and appearing to Mary, (Luke 1:26-38), telling of Mary’s pregnancy because Scripture had foretold of the Virgin being with Child (Matt 1:22-23). (presumably) appearing to the Magi in a dream (Matt 2:12), warning them of danger, which is known to the reader, but not the characters. Appearing to Joseph in a dream on two or three occasions, depending how you read it (Matt 2:13, Matt 2:19-20, Matt 2:22), warning him of danger which is known to the reader, but not to the character. 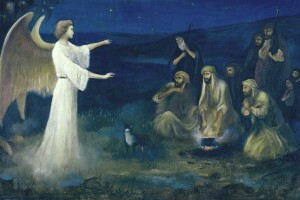 Appearing to the shepherds, announcing Jesus’ birth (Luke 2:9-14), which is known to the reader, but not to the characters. In each case, it could be said that this is the equivalent of the audience, who has the benefit of a narrator and a clearer view of all history and future events than what the characters are privy to, jumping in and interacting with story characters at key junctures. Indeed the narrator, God, is sometimes said to “send” the angels (Luke 1:26), and Gabriel reports the same (Luke 1:19), and that is the very nature of angelic appearances (Revelation 5:6, Revelation 22:6). These appearances are particularly special in the Birth and Infancy narratives of the Bible because this is the high-point of the dramatic story. God’s whole plan of past and future history has come to rest on a defenseless baby, born in a barn! Will the virgin mother comprehend what is happening? Will John the Baptist’s father give him the right name? Will Joseph divorce Mary? Will the Magi return to Herod and tell him where to find the baby Jesus? All these questions are driving the audience into apoplexy! They’re veritably screaming out the warnings and encouragements in a frenzy of excitement. What an audacious thing to say… right? Humanity has proved itself to be rebellious, sinful, corrupt, fallen, unworthy, ungrateful, stiff-necked, and generally unfaithful, right from the opening chapters of the Biblical story. 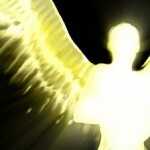 How could it be that humans will be elevated to a position of authority above that of angels? This question is implicitly on the mouths of the angels. These are the spirits who look constantly on the face of God (Matthew 18:10), do his bidding, carry his messages, and sing his praises eternally. Humanity, it is said, is made, “a little lower than the angels” (Psalm 8:5), yet it is God’s will that humanity should “judge angels”…? That’s something that is impossible to comprehend without knowing the story. God’s begotten Son is superior to the angels (Hebrews 1), and according to the Gospel the human creatures are included in Christ. By that inclusion, the human being’s very life consists in God (Colossians 3:3). 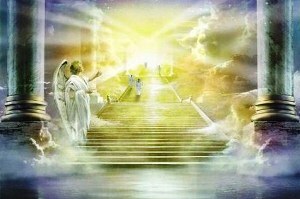 By that amazing fact, humanity is elevated past the angels, to the supreme place of authority at God’s right hand. The Book of Job is actually constructed in such a way that it is an exercise in which God uses the story of Job’s life to demonstrate a point to Satan and the angels. I am suggesting that this is actually a universal aspect of God’s method of revelation. 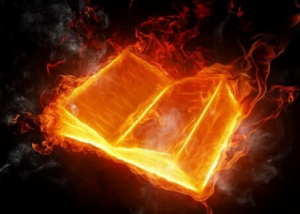 What this does, through the entire Biblical narrative, is to inform the angels why Satan and his lot will be cast into the lake of fire (Revelation 20:10), as well as to prepare them for the revelation that humanity will ultimately have authority over them. Concerning this salvation, the prophets, who spoke of the grace that was to come to you, searched intently and with the greatest care, trying to find out the time and circumstances to which the Spirit of Christ in them was pointing when he predicted the sufferings of the Messiah and the glories that would follow. Jesus Christ has put his name on Christian people. Part of the reason is so that the world might see us and learn something of the character of God (Matthew 5:16), but it is also so that the angels can understand something of God’s unshakable love for his human creature. Not only are we being watched by the world, but also by the entire heavenly host. We are not accountable to any of them because one day when we receive our inheritance we will be in authority over all of them… but they have a voice before God. They (the people and the angels) are entitled to bring accusations against us in the divine courtroom, and we are accountable to God. 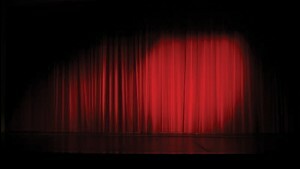 In our role as a character in the grand theodrama, we have an “audience of one”, which is God. We are accountable only to God, and owe our entire allegiance to God. But from the perspective of the universal theodrama, our audience also includes the heavenly host, who are looking on in stunned admiration at the depth of God’s love, because God has chosen to spend Himself in redeeming such wretches as us. This is the wisdom of God. This is my Christmas gift to all followers of my blog. Merry Christmas. May this bless you deeply.